In his book, Creativity Inc., Pixar president Ed Catmull details the Pixar Braintrust–one of his essential management tools. Here, in a wide-ranging conversation with Fast Company he describes how those lessons have been embraced by Disney Animation. 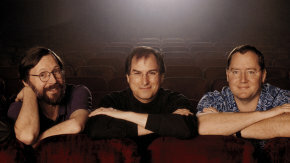 Disney already had a group of directors and story people [when Catmull and John Lasseter were put in charge of Disney Animation]. So our first step was to say, okay, these are the people we have to work with. They’re talented, but the process around them went off the rails. Our starting point was to assume that these people intend to do the right thing, so what could we do to help them understand our process? Now, prior to the acquisition being finally approved, we were not allowed to fundamentally alter their business. But we did have a group of Disney people come up here [to Pixar headquarters] and watch a Braintrust meeting. They couldn’t say anything or give notes; they just observed. The next day we all got on a plane, including the Pixar Braintrust, and went down to Disney, where they had their own–and their very first–Braintrust meeting, where our guys couldn’t talk. This was right at the end of Meet the Robinsons, which had started long before we got there. That day, according to their producer, they gave the best notes they’ve ever given. Just observing our Braintrust in action had freed them up somewhat. In our exclusive excerpt from Creativity, Inc., Catmull unveils one of his key management tools. They liked the principles of the Braintrust, the idea that you want to be honest with each other, with the director having the final say-so. But taking those ideas and turning them into real action took two years. And one way that happened was by them messing up. One time, on another film, John started off a meeting by giving notes, and as he often does, he began by saying something positive. Well, they didn’t want to run counter to what John said, so they hesitated to say what they thought. But the fact is the movie was an utter disaster at that point. So John and I looked at this and said, “Oh, good, we’ve caught them in the act!” Now, normally, a single person won’t admit that he didn’t say what he thought. But this time the whole group did it! So we called a dinner and said, “Okay, you guys didn’t do the right thing. If you do this again, we will fail. There is no Braintrust if you can’t say what you really think.” They got it, and they got better. It was a long climb upward, because the concept of trust is something which sounds good, but it isn’t something you can actually get with a ropes course. And it isn’t something you get just because it’s a good idea. It’s something where you actually have to screw up together and then realize the mistakes actually didn’t kill anybody. And they had other screwups that made them more self-aware as a group. You can’t engineer those kinds of opportunities. But when they happen, you go in and use it as a time to discuss how things should work. What they really had to learn at Disney was that they weren’t in competition with one another, but that their successes were built on each other’s. I mean, Frozen has done well, but the groundwork for Frozen was laid by Tangled and Wreck-It Ralph. Those films made the marketing folks believe that this group can now make successful films. So when Frozen came out, marketing had confidence that they could put more effort behind it. So everything came together with Frozen. But its breakout success was built upon strengthening those relationships and going through mistakes and problems in the past. Now everyone gets it. So when we have a problem down there, the other directors jump in eagerly and help each other. The culture has changed.